The Prismatic Tarot had been on my periphery for quite some time before I finally gave in. I surprised myself with my attraction to it. I tend to lean towards decks that work with the energy of the divine feminine explicitly and queer its expression beyond the very basic and cisnormative "feminine=woman". The Prismatic Tarot, on the other hand, felt like The Emperor (my birth card, so you know I'm invested) came down from their tarot throne and made their own deck and still left room for me. Which of course made me curious enough to seek out the artist behind the deck, Kelsey Showalter, and find out if they really did feel like The Emperor! Check out our tarot chat below! Hello! I'm Kelsey. I'm a gay, GNC, white, woman artist. I work as a photo editor for my day job though. It's very exciting...if you like removing zits from teenagers that is. What sparked the artist in you? I've always been drawn to art and artistry. Since I was a very small child I've been doodling and coloring and making up characters. It's just a part of my soul, you know? I don't know who I'd be if I wasn't an artist. How did you discover and get into cartomancy, specifically to tarot and oracle cards? In my early teen years I was really into vampires (this was pre-Twilight, mind you. Anne Rice style) and that drew me into the "occult" world. I think I was looking up something online and stumbled across them. I remember asking my mom about them and she explained them to me (She was a big hippie in her youth). I was fascinated by the symbols and the meanings, so I started trying to learn the tarot. It became a part of my early witchcraft attempts as well (I dabbled in Wicca before my parents freaked out that I was "worshiping the devil"). I actually hadn't worked with oracle cards before creating my own, that was an interesting experience for sure. What are you drawn to in a tarot or oracle deck? Any favorites you’re working with or have an eye on? With tarot, I'm really looking for interesting, but clear art. There's a lot of very fancy, highly detailed decks out there that are much better for looking at than divinating with. Those decks just make my mind glaze over, I don't know what it is. Currently I'm working with "Madame Clara Sees All!" the second printing. It's a great deck, very aesthetically pleasing and easy to work with. It really pushes you past just reading meanings from a booklet and more into interpreting the cards as they relate to you and your life. I backed the kickstarter the minute I saw it. It's become an integral part of my altar (Bind Trump!). What moved you to create your own tarot decks? How did the Prismatic Tarot come to be? I was in college (CSUCI, go Dolphins! ), and for our 3rd year final project we were allowed to kind of "do our own thing" for a semester. So I started making my own tarot cards. I started with just the Major Arcana, and after seeing the positive response from my professor and classmates, I decided to keep going. In your own words, what is the unique approach or perspective the Prismatic Tarot adds to the current tarot landscape? I'd like to think that it queers the tarot landscape. I wanted to make a deck that a lot of under-represented people can connect with. So many decks are very white, straight, and thin-centric. I just wanted to make something different. Do you have any favorite cards within the Prismatic Tarot? I chose the Two of Cups for the cover because I'm just stupidly proud of that card. I love it. The colors, the lion, everything. I'm also a big fan of the Three and Six of Swords. The Nine of Pentacles is a fan favorite. People like to tell me she reminds them of Furiosa, and that's quite the compliment to me haha. One of my favorite features about this deck is that there’s an app for it! What moved you to submit the Prismatic Tarot as an app? 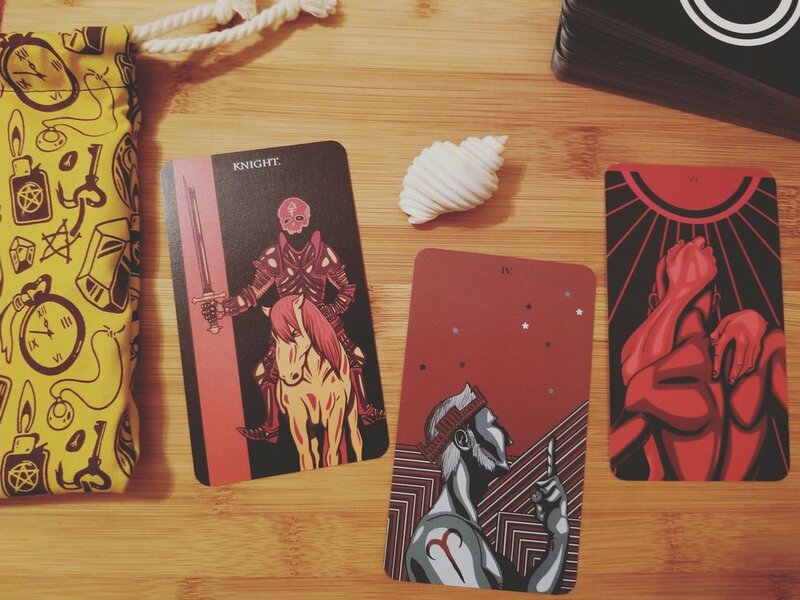 What do you think about the future of tarot and technology? I was actually approached by the Fool's Dog (the folks who run the app) about making my deck into an app. I was hesitant at first, mostly due to not wanting to lose rights to my art (read your contracts, kids), but I talked it over with them and they were very adamant that my art was mine and they were just making a digital copy of it. I think tarot has a strong future in digital. It's an ease of access thing. I mean think about it; the typical tarot deck costs anywhere from $30-$60 USD. My app is $3.99. And you get not only the cards but spreads and tutorials on how to use them. It's great! I am working on a non-figurative deck at the moment (it's taken a bit of a backseat to fun scribbles from my D&D campaign, but it's coming I swear), and once that's done, it's off to start another Kickstarter. I've been mulling over a "booster" deck for the BPO, but we'll see. It's on hold for now. Where else can we find your art? How can we support you, this project, and all your future art? I have a Tumblr! It's Wingy's Art, if you just wanna browse. I'm open for commissioned work, just drop me a line. If I start any Kickstarters or sales, they'll be on there as well. If you're interested in buying a deck, I'm also Wingy's Art on Etsy. Thank you so much for your interest! It's wild to be interviewed like this. I suppose the only thing I'd add is good vibes and blessed be! Kelsey's unnamed tri-color deck that I can't wait for!